Consistently rated one of the best honeymoon destinations, Hawaii offers great beaches, warm weather year-round and many things to do. You can go snorkeling, surfing, play golf or relax in the sun. 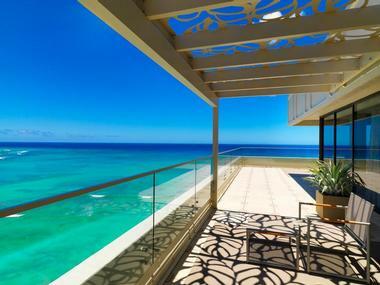 A week in Hawaii is a great way to spend a honeymoon, whether you check into a full service luxury resort, romantic inn or rent a condo. Choose from many great places to stay, championship golf courses and relaxing spas offering a variety of unique treatments. Our list includes luxury and affordable Hawaii honeymoon escapes on Maui, Oahu, Kauai and the Big Island. 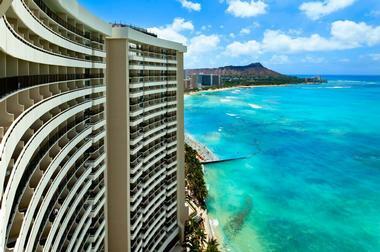 The Sheraton Waikiki Hotel is a great hotel for honeymooners located right on Waikiki Beach. This large hotel has three restaurants, two cocktail lounges and a nightclub. From surfing to cultural events and shopping, the area offers a number of things to do. There are 1,695 rooms and suites. Over two-thirds of the guest rooms face the Pacific Ocean. Ask for a room with a view of the Pacific. The Hanohano Room, located on the 30th floor, is a great restaurant for a romantic dinner, offering views of the ocean and Diamond Head. Arrive before sunset and ask to be seated next to a window. For outdoor dining, try the Ocean Terrace which offers seafood buffets and classic island cuisine. If you are interested in shopping, there are numerous shops a short walk away. For a view of the ocean, ask for one of the rooms facing out to sea. City view rooms, however, are usually cheaper. Doubles from $239 per night. VacationIdea.com Travel Tip: Save with booking a honeymoon package. Look for free breakfast, which can be expensive in Hawaii, activities and romantic amenities. 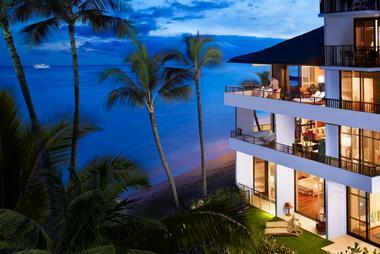 Radiating luxury at every turn, Hotel Wailea, a Relais Châteaux, is a hidden gem along Maui’s coastline. Perched above crescent-shaped shores, this luxurious beachfront resort offers a unique Hawaiian cultural experience in the heart of this Polynesian paradise. Designed to complement the unspoiled tropical surroundings, 72 luxurious suites feature private lanais for admiring magnificent Hawaiian sunsets, deep-soaking tubs with ocean and garden view showers, and plush bathrobes. Dining is an unforgettable experience at Hotel Wailea. Capische? serves an exotic fusion of Mediterranean-inspired cuisine and superb wines, while the relaxed poolside Cabanas is the perfect place for light al fresco meals and colorful cocktails at sunset. Enjoy an array of activities around the island from beach safaris and cocktail cruises to kiteboarding lessons, outrigger canoe trips and beach yoga. Explore underwater kingdoms as you snorkel or dive with a variety of amazing marine species or try your hand at deep-sea fishing in the indigo waters off the island. If you are looking for a Hawaii honeymoon on the beautiful island of Maui, rooms at this unique hotel start at $405 per night. More Hawaii honeymoon ideas: 10 Best Romantic Things to Do in Honolulu, Oahu. Moana Surfrider, A Westin Resort & Spa was the first resort hotel built in Waikiki Beach in 1901. It features beautiful architecture, scenic views and renovated guest rooms. This island getaway has a freshwater swimming pool and three restaurants. The area offers a number of things to do, including swimming, surfing, outrigger canoeing, catamaran rides and kayaking. Moana Lani Spa offers relaxing Hawaiian and international treatments. The hotel is near many shops, the Honolulu Zoo and Waikiki Aquarium. Guided walking tours are offered several times per week. Afternoon Tea is a tradition since the early 1900s, featuring white-gloved attendants serving freshly brewed teas. In the evening, guests can listen to romantic Hawaiian music in the Banyan Court. The hotel offers 793 luxurious rooms, including 46 suites. Rooms are available in the historic building and in the tower. Ask for a room with a view of the ocean. 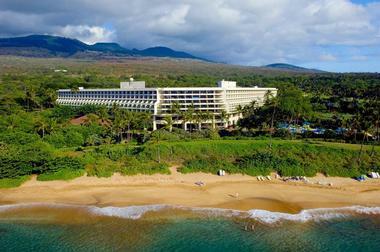 Nearby hotels include The Royal Hawaiian, The Outrigger and the romantic Halekulani. Doubles from $260 per night. Waikiki Parc Hotel offers its guests a rooftop swimming pool and personalized surf lessons. You will be within easy walking distance of shops, restaurants and cafes. The beach beckons with its soft sand just steps from the hotel front door. Ask for a rooms with a view of the ocean when booking your stay. You can have morning breakfast on the terrace, take a surfing lesson, lounge by the pool, swim in the ocean and explore local shops. Nobu serves innovative Japanese cuisine prepared by Chef Nobu Matsuhisa. The restaurant is located in the lobby. Enjoy sunset drinks on the outdoor terrace overlooking the ocean. Room rates start from $223 per night. The "Park Sunrise Bonus Package" starts at $251 per night and includes: rental car, Buffet Breakfast, free parking, tickets to several museums. More Hawaii vacation ideas. 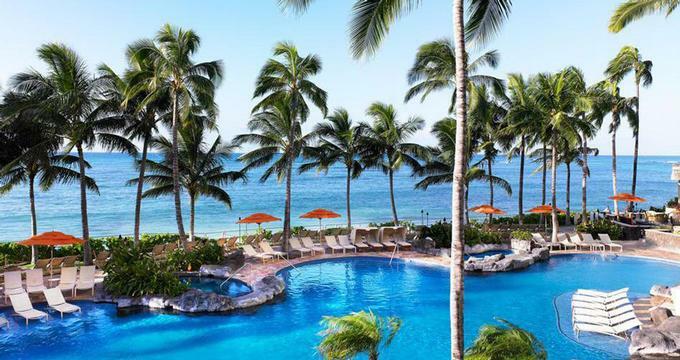 Mauna Lani Bay Hotel is a luxury oceanfront getaway on the Kohala Coast. Lush tropical grounds feature Hawaiian fishponds, lava flow, and ten man-made ponds with colorful fish and sea turtles. There is a beautiful white-sand beach, two scenic 18-hole golf courses, tennis club, sports center, and a full-service spa. The spa has a unique indoor/outdoor design with treatment huts, lava saunas and a meditation pavilion. Vacationers can choose from a selection of daily classes, including Yoga, aerobics, dance and others. Guests can choose from a selection of watersports, and sign up for the Children's Camp. Atrium-style entrance with waterfalls, tropical plants and ponds leads to 342 guest rooms, most with ocean views. For the ultimate indulgence, book one of the five individual bungalows, each with a private swimming pool and a 24-hour butler. Read also: 12 Best Luxury Honeymoon Villas. The signature restaurant has views of the ocean. There are many other restaurants at the resort. Remember to book your spa treatments and tee times before you go, especially in high season. Rooms start from $430 per night, depending on the season. Golf, family and spa packages are also available. Children's Camp rates start at $50 per day. Couples looking for the ultimate luxury getaway can book one of the five private Bungalows. These accommodations come with a five star treatment that includes stretch limousine pickup at the airport and a 24-hour butler. Each Bungalow measures 4,000 square feet in size and has a private swimming pool. There are two master bedroom suites with their own entrances to the pool, three marble baths, private garden enclosures and a living room. Couples can enjoy as much privacy as they want. The butlers are ready to fulfill requests ranging from cooking for a party to arranging last minute romantic picnics and tours of the island. Remember to fill out your pre-arrival questionnaire so that the staff can prepare personal touches such as champagne, magazines and foods that greet you when you arrive to the resort. Rates range from $4,900 to $5,600 per night. Ocean View rates start at $4,000 per night and Ocean Front from $4,500 per night. There are quite a few places in Hawaii where you can spend your getaway enjoying the peace and quiet of nature. 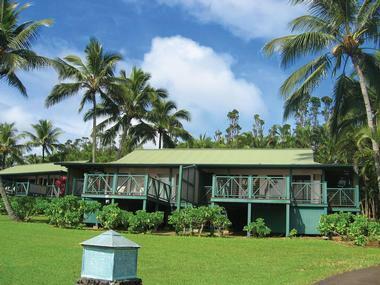 Travaasa Hana has a natural spa, the beautiful Hamoa Beach and luxurious accommodations. The hotel is located on the secluded east coast of Maui which you can reach by driving the curvy Hana Highway or by flying directly from Honolulu. Some people find Hana too secluded - the town has one general store and a restaurant. However, Hana is one of the best places to go in Hawaii if you want to slow down and relax. We arrived at Travaasa Hana tired from driving the unusual Hana Highway. Almost instantly, while we were still in the car, a concierge and a bellman appeared to offer a refreshing drink, a beautiful purple lei, valet parking and help with the bags. Following a swift check-in, a friendly hotel employee escorted us and our bags on a golf cart to our luxurious cottage overlooking the ocean. After this fabulous arrival experience, Travaasa Hana continued to impress with its luxury service. Room service was quick and efficient. It was a pleasure to dine at the round table facing floor-to-ceiling window of our Sea Ranch Cottage. The food was delicious; the meals at the hotel restaurant are prepared with fresh local and organic fruits, vegetables and seafood. Guests have no worries with tips while staying at the hotel - there is a tipping fund to which you can contribute at the end of your stay. If a particular employee is especially helpful, you can acknowledge them separately with a tip. If you require anything while staying in your room, simply pick up the phone and dial 0. The operator will forward your call, forward the voice mail and answer any questions about the hotel. The best surprise was the luxury Honua Spa at Travaasa Hana. Enjoy a therapeutic massage, try the steam room with the outdoor plunge pool, or simply relax in the tropical garden enjoying open ocean views. The Seven Sacred Pools in Haleakala are a 45-minute drive from Hana. Go there to swim or hike to one of the waterfalls. The land is simply beautiful with lush foliage, running water and different tropical plants. Wailea and Kapalua resort areas both offer championship golf and gourmet dining. 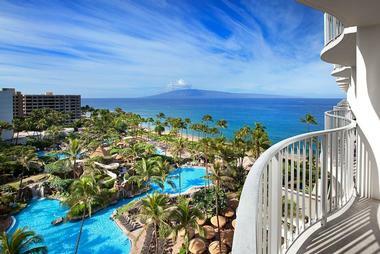 Grand Wailea Resort has a wide sandy bay, a luxurious spa and water slides for kids. The Shops at Wailea sell works of art and luxury goods by famous brands such as Tiffany & Co. and Louis Vuitton. Hyatt Regency Waikiki Resort & Spa is located in the center of Waikiki. The hotel has a spa, fitness center and a heated outdoor swimming pool. Waikiki Beach offers a number of activities, including surfing, swimming, kayaking and canoeing. In addition to quick access to the beach, the hotel is within walking distance of Diamond Head, Honolulu Zoo and the Waikiki Aquarium. Activities include relaxing at Na Ho'ola Spa, pool, hot tubs, Camp Hyatt for kids, gym, yoga and Hulacise. Guest rooms are located in two hotel towers. If you want a view of the ocean, Deluxe Ocean Accommodations feature private terraces with a view. Choose from 1,300 guest rooms and suites on your trip. Accommodations feature private balconies with ocean, mountain or city views. Rates start at $195 per night. Dining options range from fine international cuisine to light fare. The Colony restaurant serves lobster, fish and grilled steaks. Ciao Mein offers both Chinese and Italian cuisine. For a taste of authentic Japanese cuisine, visit Musashi. Enjoying a spectacular location at the foot of the Diamond Head Crater, this modern Hawaii hotel is only minutes from the excitement of Waikiki. 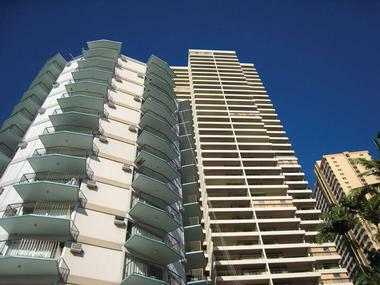 Among the nearby attractions are Kapiolani Park, Waikiki Aquarium, the Honolulu Zoo, and Pearl Harbor. Waikiki offers swimming, sailing, snorkeling, and other water sports, while Honolulu features numerous shops and restaurants. The Aqua Lotus Honolulu is furnished in Belinese style with contemporary teak furniture and textured white fabrics. The main common area is an airy space where guests can relax, enjoy a drink, play a game of chess, backgammon or tic-tac-toe. 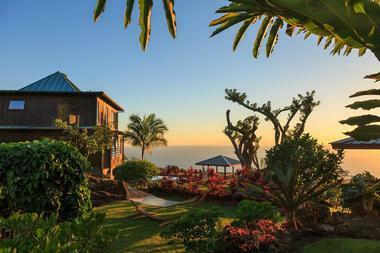 All 48 guest rooms, furnished in luxurious style, offer views of the Pacific Ocean or the Crater. The Diamond Head Grill, open for dinner, presents a unique menu composed of Asian, Euro-American and Polynesian cuisine. The restaurant uses fresh locally grown ingredients, such as exotic vegetables, herbs, and tropical fruit. Guests enjoy 24-hour In Room dining. The stylish bar serves signature drinks while various guest entertainers play contemporary jazz music. WonderLounge offers dancing in the evening. Doubles start from $280 per night. Enjoy romantic sunsets, go snorkeling, sailing and kayaking on your getaway. Kapalua Resort on West Maui is famous for is Plantation Course where the Mercedes Championships are held every January. 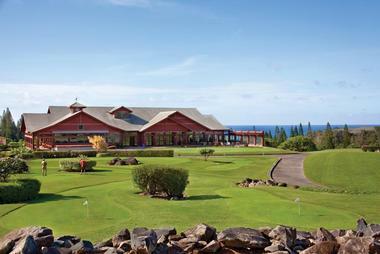 The resort has two championship golf courses and the Kapalua Golf Academy which offers individual instruction, corporate clinics, golf schools and daily clinics. Stay at the luxury Ritz-Carlton, Kapalua offers the Ritz Kids program for children ages five through twelve. Makena Resort fronts the secluded Maluaka Beach on South Maui. This family-friendly luxury hotel has a pool, several restaurants, two golf courses and a tennis center. The Fairmont Orchid hotel, located at the Mauna Lani Resort on the Big Island of Hawaii, has beautiful suites, elegant restaurants and a sandy bay. There are two scenic golf courses at the Mauna Lani, several beaches, daily yoga classes and two luxurious spas. 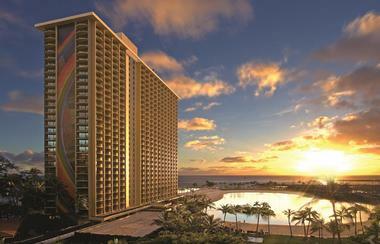 Hilton Hawaiian Village offers over 20 restaurants and many vacation activities. 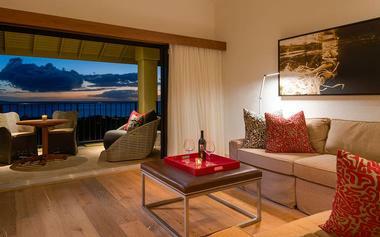 Those looking for a more secluded getaway on Oahu can head to the island's north shore and stay at Turtle Bay Resort. The resort has guest accommodations just steps from the water. If you plan to spend time on the beach, stay at the Royal Hawaiian to get access to the roped-off section of the shore. Hotel guests get complimentary lounge chairs, towels and umbrellas. Oahu offers the perfect setting for a romantic getaway with its sandy bays, spectacular sunsets and luxury resorts. Many resorts spas on Oahu offer massages and other innovative treatments for couples. 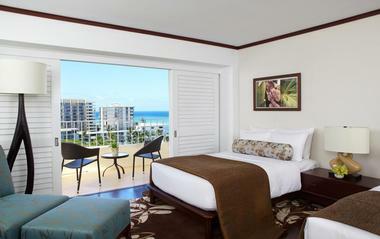 Ocean view rooms at Halekulani Hotel in Waikiki are popular with honeymooners because of their large lanais. The hotel, known for its attentive service, has a spa and an elegant oceanfront restaurant. SpaHalekulani is inspired by Hawaiian and South Pacific traditions. Waikiki Beach Marriott Resort & Spa, located across the street from Waikiki Beach, has a new spa on the second floor of the Kealohilani Tower. Spa Olakino offers specialized treatments and traditional Hawaiian remedies that rejuvenate and relax. Exotic Hawaiian plants and fruits are used to make fresh products which are utilized during the treatment. The spa measures 6,000 square feet in size and is operated by Paul Brown. 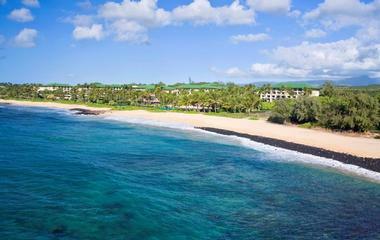 The Westin Maui Resort is located on the famous Kaanapali Beach in Maui, offering spectacular views of Molokai and Lanai. Tjos is a AAA four diamond property with a luxury spa and gourmet restaurants. The area is great for families who like to try an array of activities, from surfing to hula lessons. The concierge can help you with any questions about the island, golf and restaurant reservations. Many of the guest accommodations have spectacular ocean views and all of the accommodations feature the trademark Heavenly Bed. 759 guest rooms and suites are located in two 11-story towers. The higher room that you book, the better the view of the Pacific Ocean from your terrace. The hotel has an Avis car rental desk, a kid's programs, ocean activities center, and a full service business center. Start your day with a delicious buffet breakfast. If you are traveling with children, consider the Kids Pass which gives children ages 4 to 12 years old all-inclusive dining for a flat rate of $25 per day. Plan an intimate island celebration or a grand ceremony on Maui. The Westin Maui Resort & Spa in Ka'anapali has a team of expert event planners that can help you with every detail for your special day. You can get married with a view of the ocean, one of the favorites with couples. Choose a sunset ceremony which will ensure the most stunning photographs. Venues to choose from include a waterfall setting for intimate celebrations, Lokahi Point with ocean views, Hale Aloha Gazebo surrounded by water, Lawn and the Aloha Pavilion for larger weddings. Before your big day, head to the spa for some last minute pampering and relaxation. The hotel offers a selection of marriage packages, vow renewals and other special events. Offers start at just $1,275 for a small event of up to 8 guests. Rooms start at $430 per night. 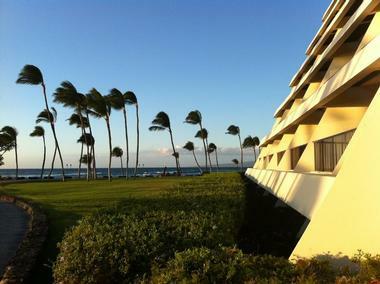 Hapuna Beach Prince Hotel is a scenic getaway located on 1,800 oceanfront acres on the Big Island of Hawaii. 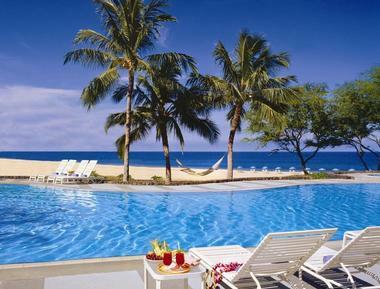 The hotel overlooks the beautiful Hapuna Bay and offers many activities, romantic beaches and dining choices. 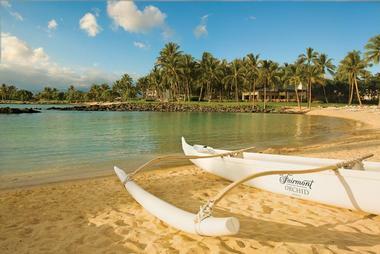 It is the sister property of the Mauna Kea Hotel with which it shares the 1,800 oceanfront acres. The spa offers a range of treatments, including massage, body wraps and beauty treatments. Honeymooners can take fitness classes or relax in the steam room or by the pool. In the winter, you'll be able to see the whales right from the beach. Rent a kayak, go sailing or deep-sea fishing. Three nights a week, guests at the resort can stargaze through a telescope with guidance from an astronomer. The Hapuna Golf Course is an 18-hole championship golf course with great views of the Kohala Coast, the Pacific Ocean, Mauna Kea, Mauna Loa and Kohala Mountains. The golf course has a challenging layout that raises from the shoreline to about 700 feet above sea level. There are 350 rooms and suites with a private balcony and an ocean view. The hotel's signature restaurant Coast Grille features an Oyster Bar and Pacific Rim cuisine. Guests can dine indoors or outdoors. Other dining options include the casual Ocean Terrace, Arnie's, Bar, Reef Lounge and Seafood Fest. Hawaii is a great place to visit year-round. The resort is about 45 minutes from the Kona International Airport by car. Room rates from US $225 per night. Look for last minute deals and special. Grand Hyatt Kauai is a 600-room spa and golf getaway in Kauai. Guests get to play scenic golf on the Robert Trent Jones 18-Hole Golf Course. Kauai is the oldest of the Hawaiian Islands and has lush tropical rainforests and sandy beaches featured in many movies. Anara Spa offers treatments inspired by the healing philosophy of ancient Hawaii. The spa was recently expanded to include outdoor treatment space, waterfalls, soaking pools and a couples' hale. Each open-air thatched-roof hale has its own secluded garden, private lava rock shower and a grotto. The luxury hotel offers many activities every day, so you can be sure that you won't be bored. In the morning, there is a sunrise fitness walk at the spa, Koi fish feeding and a tennis clinic. There is also a parrot talk, a golf clinic, live music and other vacation activities. 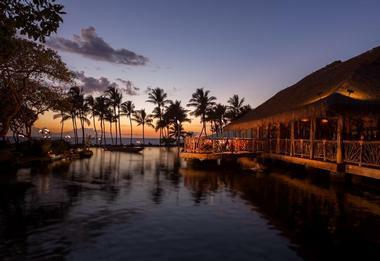 For a unique dining experience, book a table at the award winning Tidepools restaurant which serves a combination of contemporary Hawaiian cuisine surrounded by open air thatched huts with waterfalls and lagoons. Get married on the sand or on a beautiful lawn - the resort offers a team of expert wedding planners and can host both small and large wedding receptions. Guest rooms have private balconies with mountain, garden or ocean views. Rooms from $360 per night. 25 Best Small Town Honeymoon Destinations in the U.S.
25 Best Secluded Honeymoon Destinations in the U.S.